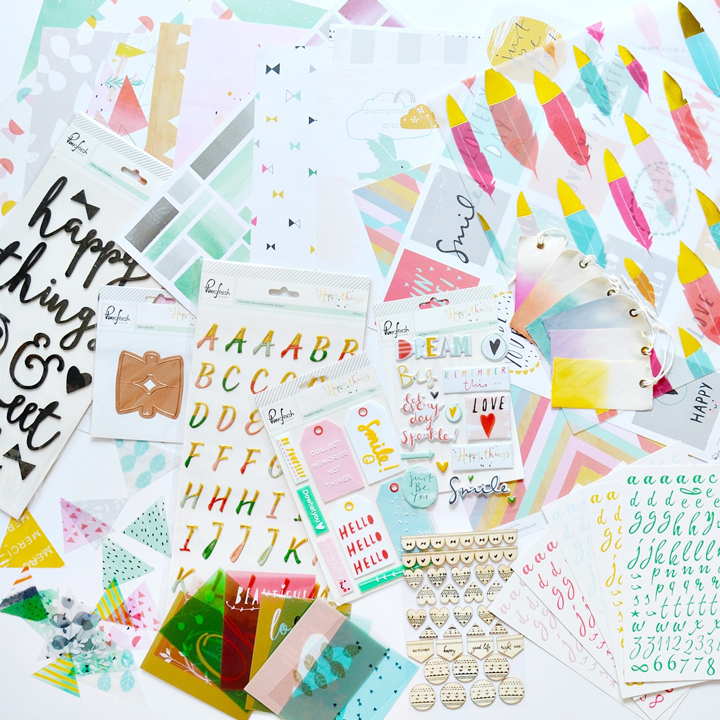 When I saw the big reveal of the Happy Things collections by Pinkfresh Studio, I pretty much begged Kinnari to send me some :) I was sooooo happy when a big ol' box of loveliness arrived in my mailbox! DESCRIPTION: I've been on a "pile all the things into a collage" kick lately! Here I layered everything down the center of this fabulous patterned paper. JOURNALING SAYS: Colmar, France is such a dream - so many cute and colorful buildings everywhere! Straight out of Beauty and the Beast! HOW TO: It's sort of like a puzzle to do this technique: pick out all of the elements you want to use, along with a photo and title, and then have fun collaging them down the center of a patterned paper background. Journal right on a fabric tag. Drop black India ink around three places for a visual triangle. DESCRIPTION: Those triangles tho!! 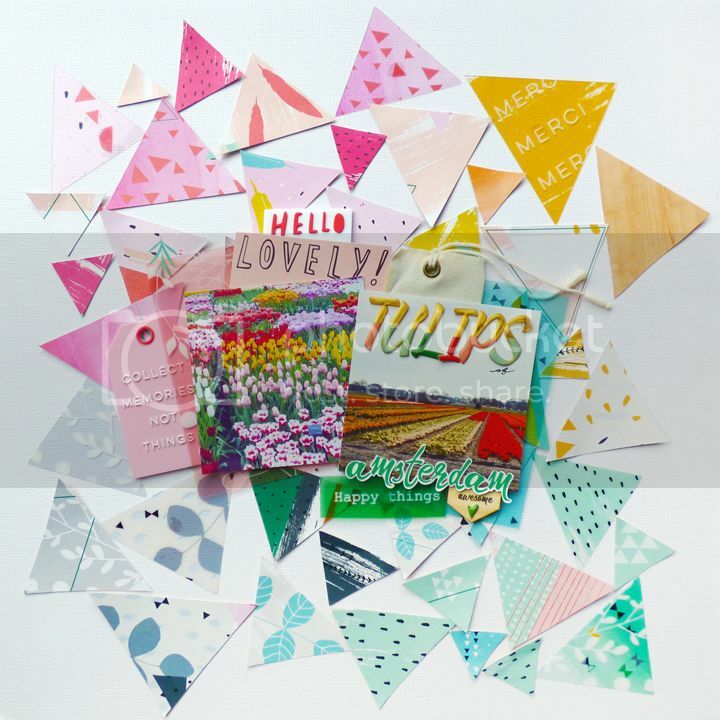 I love patterned transparency triangles and ALL of the triangles printed on one of the patterned papers. I cut them out and challenged myself to use them on a layout. JOURNALING SAYS: Collect memories not things. 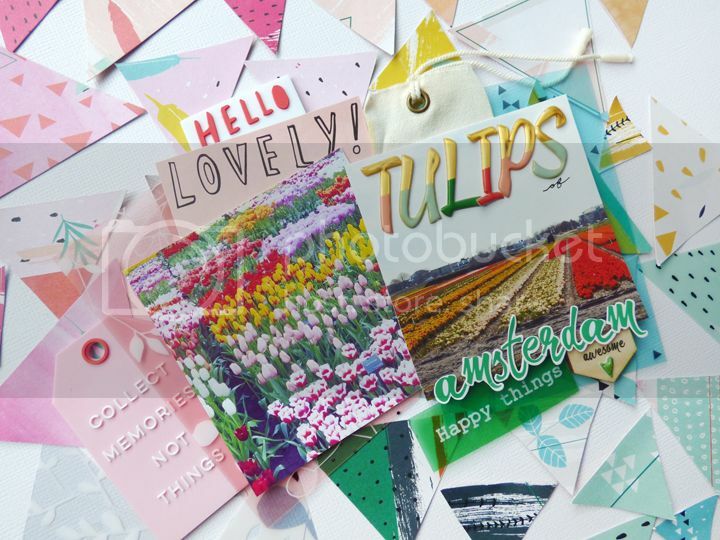 HOW TO: Trim out all the triangles from one of the Happy Things patterned papers then glue them along with the patterned transparency triangles onto a white cardstock base. Layer a pair of photos over transparency cards onto the center of the layout and tuck embellishments underneath the edges. Make the title with letter stickers and write "of" with a black pen to finish. JOURNALING SAYS: I'm pretty sure the Alsace region of France is the most picturesque place in the world! Every view is so quaint and adorable! 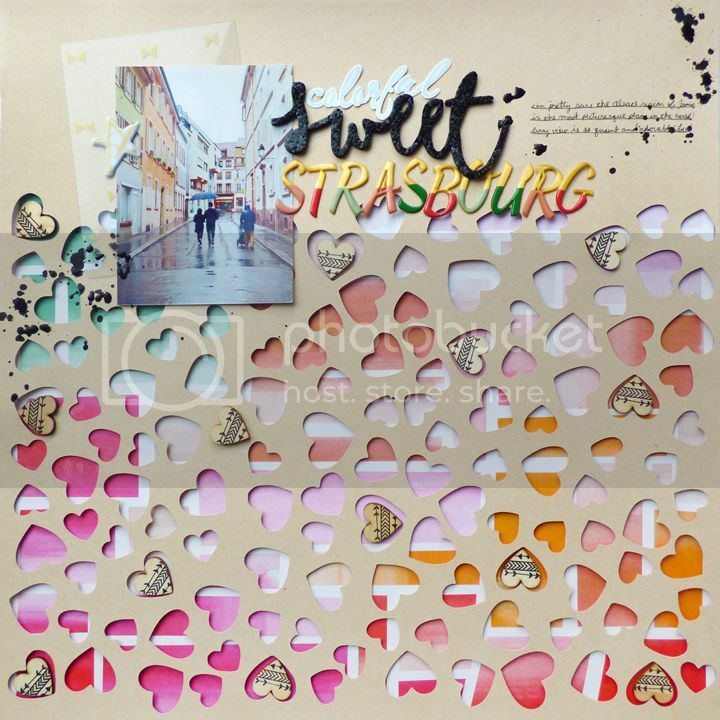 HOW TO: Use a Silhouette Cameo and die cut the Confetti Heart Background by Ashley Calder from kraft cardstock. 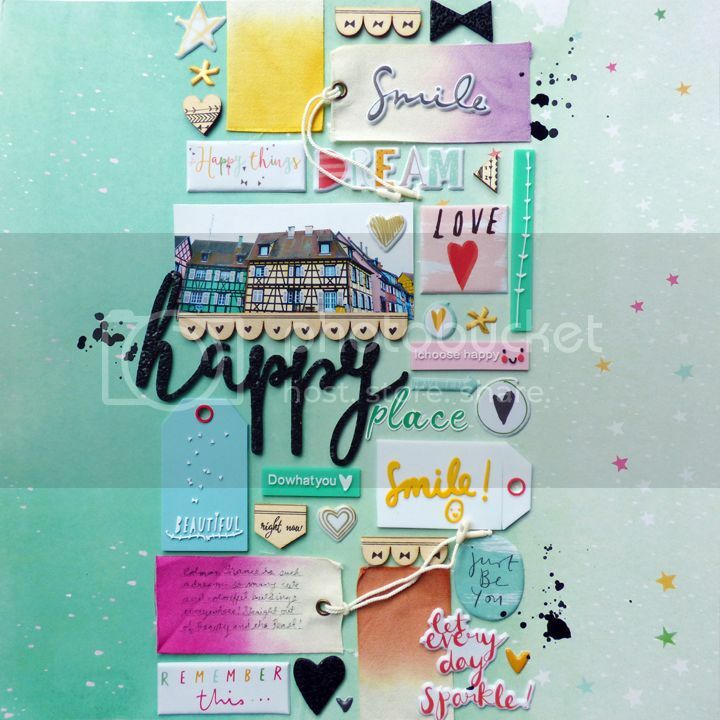 Back the cardstock with a watercolor patterned paper using foam dots. Add a photo, transparency card, and a title on the top. Place wood veneer hearts inside some of the die cut hearts then drop India ink around the photo/title. Journal on the top right corner. I super duper pretty much LOVE this collection! seriously INSPIRING! I have to admit I have had a piece or two to play with from this collection and its AWESOME! LOVE the collages. Just fabulous, Paige! You never cease to amaze. The house looks like something you would find in Germany - half-timbered house....love it.